There are few things more important in life than understanding who you are. Part of understanding who you are is understanding who you’re not. Confidence is drowned out by insecurity. The more secure we become in who we are the more confident we will be as people. Transforming insecurity into confidence is as easy as understanding who I am not and saying “that’s okay because I know who I am and who I am is good enough.” Personally, I have accepted the fact that I am, and always will be, shorter than the average male…and I have become okay with it. I don’t have the greatest smile or a personality that everyone is attracted to but I know what I do have. Once we accept and become okay with who we are we will naturally walk with more confidence. Someone smarter than me said something along the lines of “Courage isn’t the absence of fear, it is the willingness to do something even though you’re afraid.” The most confident people aren’t the people who are the least afraid, they are the people who are willing to push forward in the face of opposition. Courage is like a muscle- you might have to start off with something small but before you know it you will be lifting with the big boys. Take a step each day to do something you are afraid to do. Before you know it, you’ll be changing the atmosphere of every room you walk into because you hold a posture of confidence and maintain a lifestyle of courage. Everyone has bad days and sometimes we need some people around us to remind us of who we really are. More than that, confident people surround themselves with confident people. My job requires me to deliver anywhere from 5-40 presentations a week. I try to make them both funny and engaging. One thing I have noticed is the more people who are in the room; the more energy, the more life, and truthfully the funnier my jokes are. The effect that one joke has on a room of 15 people versus a room of 250 people is night and day. Confidence works the same way. When you surround yourself with a community of people who are confident and are constantly doing courageous things it naturally calls the greatness out of you. 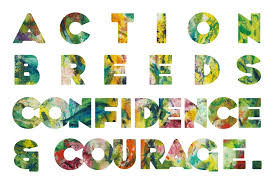 Be courageous even if you don’t feel courageous and confidence will surely follow. Honoring others creates a natural humility in our own heart which is essential for not popping the curb of arrogance. There seems to be this stigma that “elevating others is going to somehow harm myself…” Really, that’s insecurity saying “Making someone else look good is going to take away from my own significance.” If you find your heart having those thoughts, that’s okay just spend a little extra time on #2. There is no quicker road to confidence than striving to cultivate and elevate the greatness of others. Encourage someone today and you will find that you are walking away encouraged as well. Repeat steps 1-4 as needed. Subscribe for more at the bottom of the page!